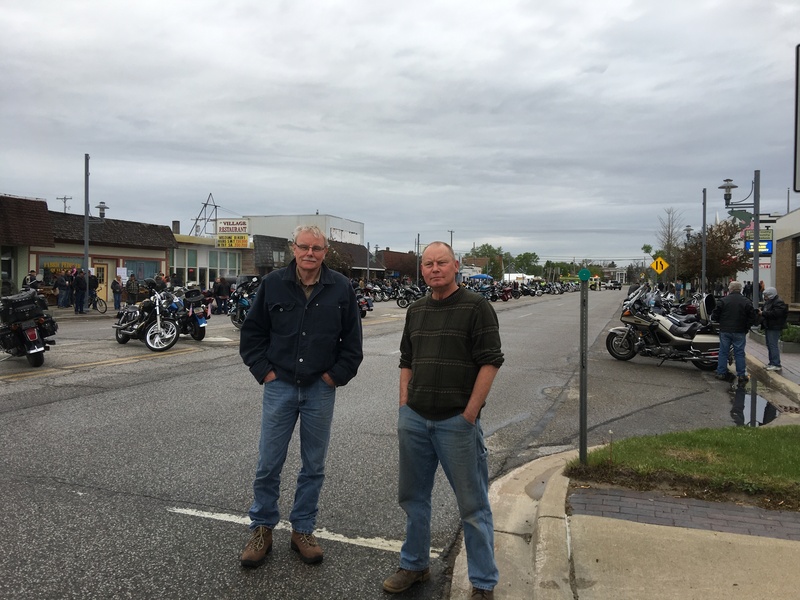 Our annual spring trout camp coincided with the Blessing of the Bikes in Baldwin, Michigan, an annual event that draws upwards of 30,000 bikers. I speculated ahead of time the campground at Leverentz would be filled up with big Harleys turning the campground into a motocross track. Cold rain dampened the biker turnout, only one motorcycle found the campground, a young couple that seemed leery of the loud and rowdy fishermen. So much for my imagination! The cold rain helped the fishing. 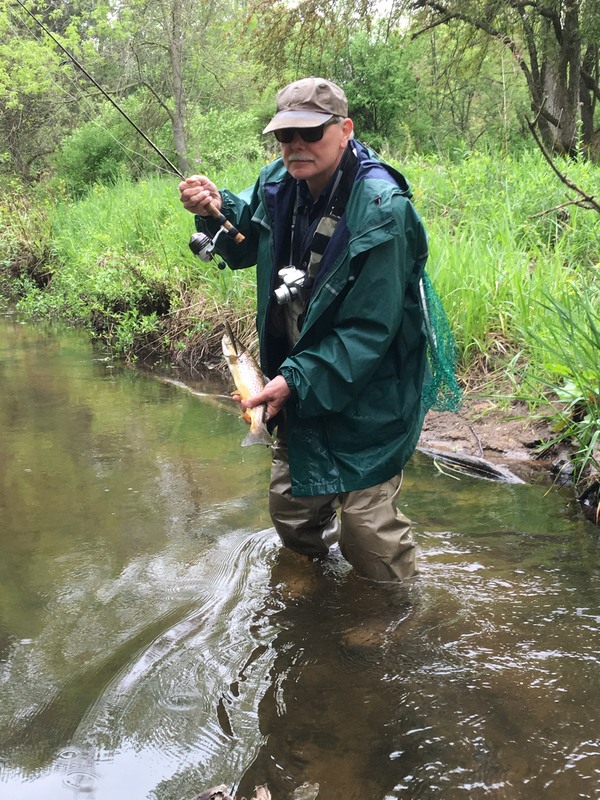 We fished the Pine, the Zinc, the Little South and the Middle Branch of the Pere Marquette. 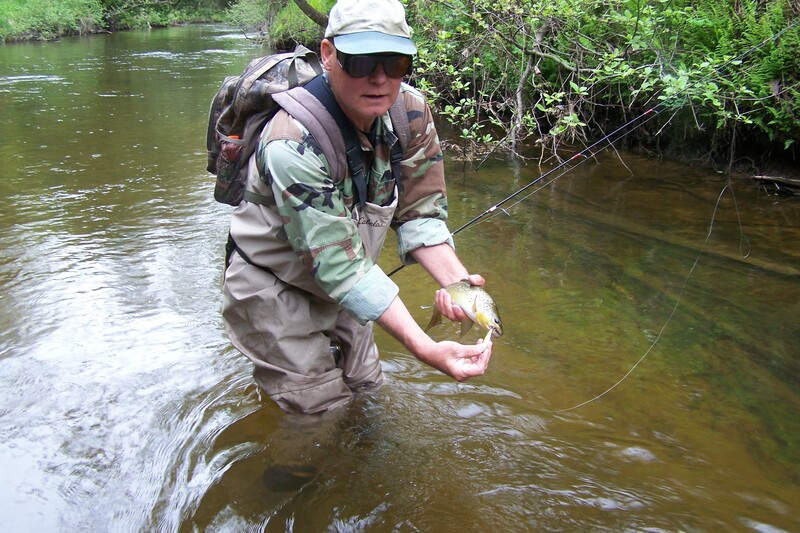 We caught decent fish on all streams. Natch took big fish honors with a 21 incher on the Zinc. I followed that up with one about 15 inches, shortly after tripping and going in for a swim. 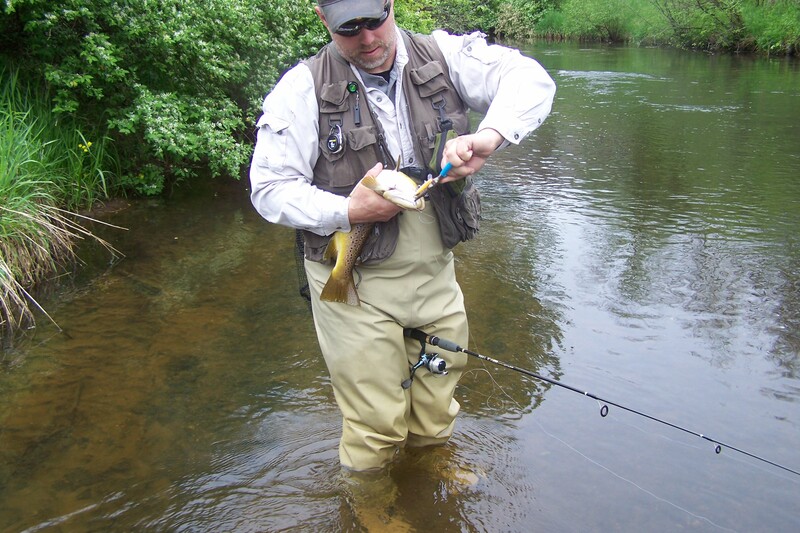 My leg was over a boulder and I couldn’t stand up so water poured into the top of my waders. That did it for my camera but Natch had his iphone. One a single trip around Big Leverentz Lake Feral caught seven pike. He kept one for the skillet along with a trout from the Pine. We powdered then with shore lunch brand cajun fish mix and pan fried them while knocking down way too many Labatts. Before long the guitar and mandolin came out and Natch surprised us with a tambourine. We played the long version of Buenos Tardes Amigo (Ween) whereby the beer influenced the order and spontaneity of verses. It’s a long song anyway but we had no trouble stretching it to 20 – 25 minutes. We stopped into Baldwin to check out the motorcycles. Bikes were lined up on both sides of main street and vendors were set up to sell food, clothes, trinkets, beer, you name it. We saw a lot of tricked out bikes including a vintage Harley from the 1940’s. We had to hand it to the bikers that showed up despite the cold and rain. Most show up every year no matter what. Last year they had snow so at least it was a minor improvement this year.